I’ve been a fan of BrickArms’ Mystery Packs since they started coming out this year, but unfortunately I didn’t get enough of the first wave. A few weeks ago I found out there were no more on offer… and then by chance I found out they released a Volume 2. 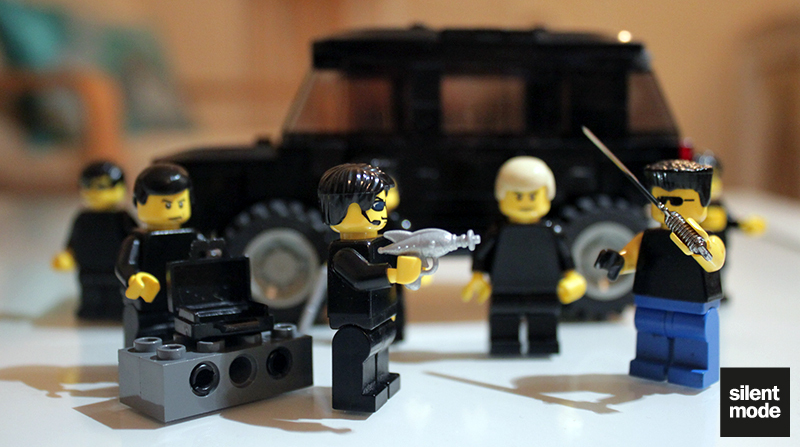 Big shout out to minifigforlife.com, the UK branch of the weapons cartel, for making these available over here. 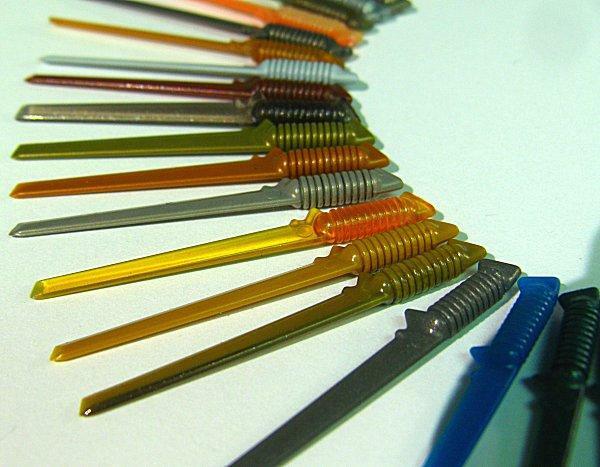 The first volume contained a number of random weapons, in random and unusual colours, per pack. The big draw back then was that, hidden in 1:20 packs, was a 24-carat gold part. Some guy who reviewed that volume here on EB was fortunate enough to get one of these parts. The second volume is remarkably different from the outset: you only get four weapons per pack, and three of them are predetermined: all three of these predetermined weapons were released to the public earlier this year. The odds of finding a gold weapon have decreased to 1:100, although there’s the suggestion that you might find more than one gold weapon in a pack. But there’s a 1:100 chance of finding a fifth weapon in a Mystery Pack: a rare prototype weapon. What could these be? 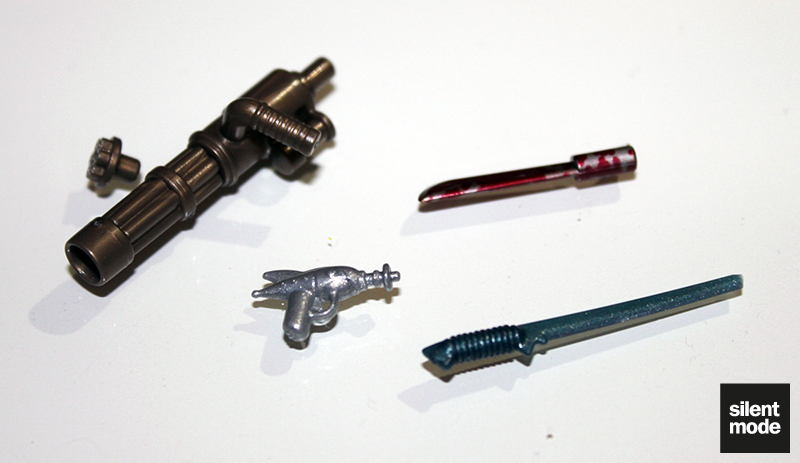 You can buy the minigun in different colours to the ones shown here, however they (along with the miniguns found in these packs) don’t come with universal clips or bullets. Getting the minigun in these colours already makes this Mystery Pack worth getting, although this is the only weapon that won’t come in the rare gold variety. I don’t know about you, but the sound of a glow-in-the-dark minigun sends my body tingling. I bought a few of these when they first came out, and while I have mixed feelings about them in general these are very stylish. 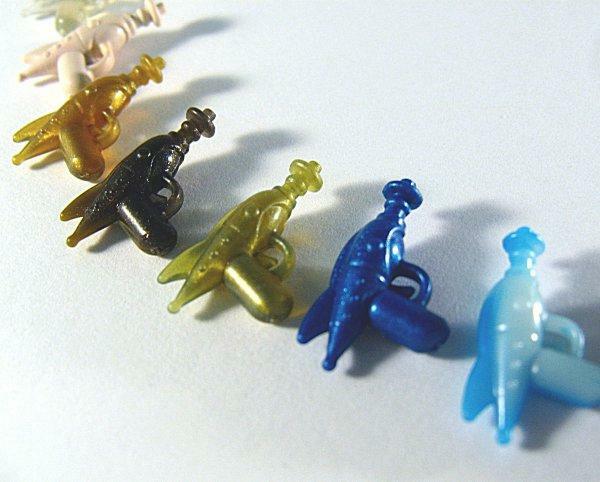 Third is a niche favourite, the retro ray gun. Personally these aren’t for me, and I’d be looking to pass these on very quickly – but they’re very well designed and a must for Space enthusiasts. I can imagine a chromed version being highly desirable. 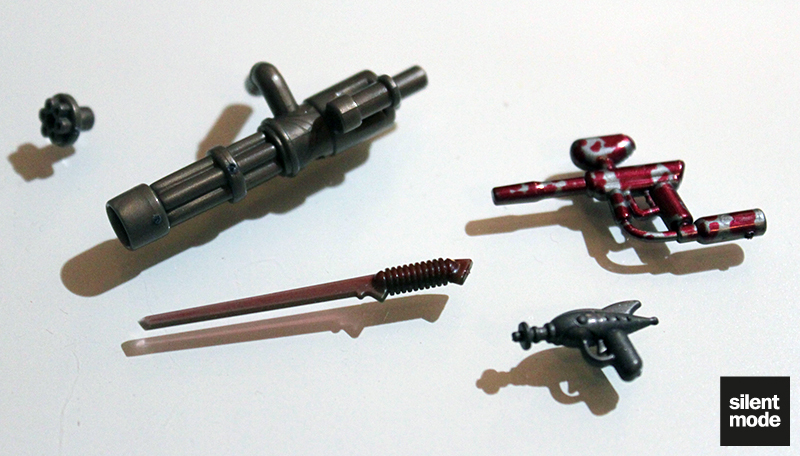 The luckiest pack of the four: not only did I get a red minigun, but a sweet chrome tactical sword. Not sure if it’s the black or “bright” chrome. The combat knife is very appropriately patterned. 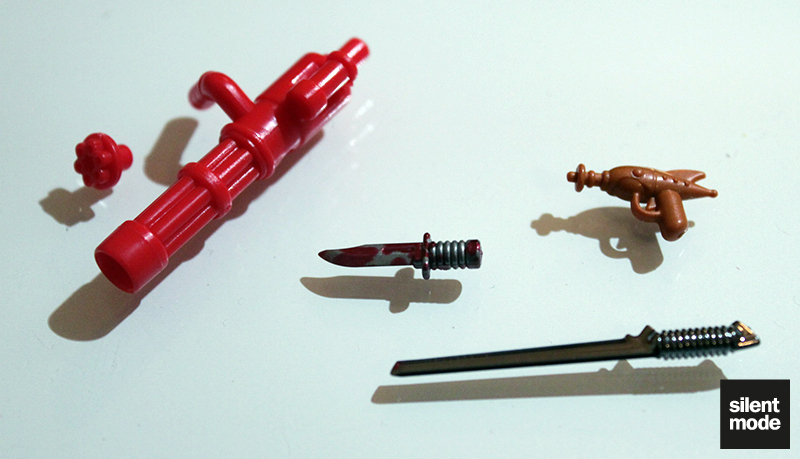 A blood-spatter paint gun and a rather nice-looking “rusty” sword. An also rather appropriate chainsaw extension, along with a rather nice metallic silver sword. 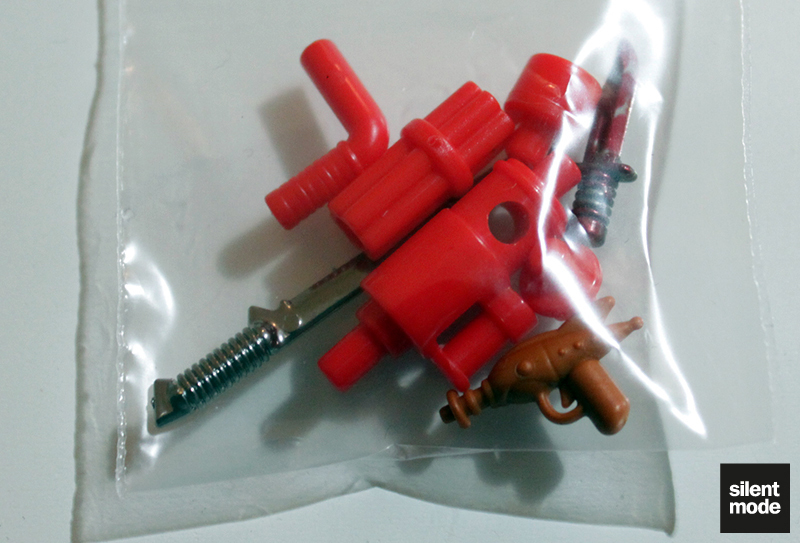 The ray gun is also an interesting colour. Continuing the appropriateness of the blood spatter, a machete. 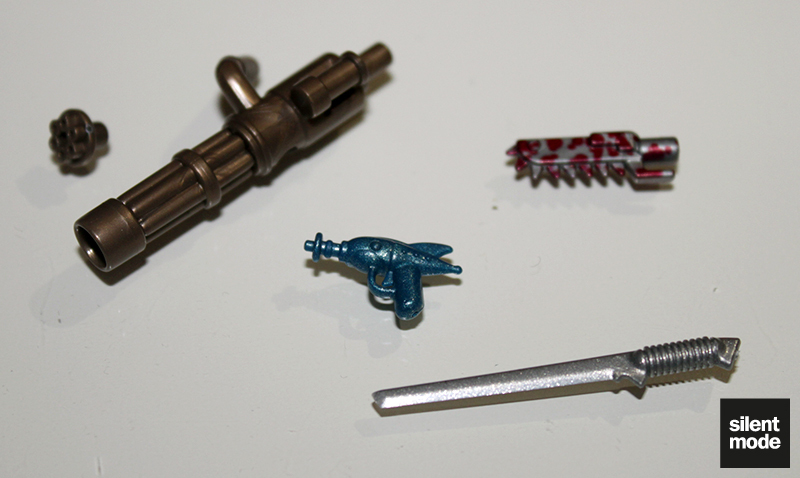 We also have a very nice-looking silver ray gun, and a metallic blue sword. I should point out, at this juncture, that the minigun in packs 2, 3 and 4 are the same damn colour – some kind of metallic brown. I was really hoping for a green/transparent green – even a blue one would have made my day. The fixed line-up of weapons may be off-putting to some, especially given the predetermined weapons and the price of each pack. It might be less expensive and time-consuming to look around for the part you want, either as a sale or trade. In the end, a bit like the Collectible Minifigures, it’s a personal decision. Personally I would drop the ray gun in favour of two random grenades. Score out of thin air? Okay, How about a 7.0/10. Thanks for reading, and be sure to support your local weapons dealer.